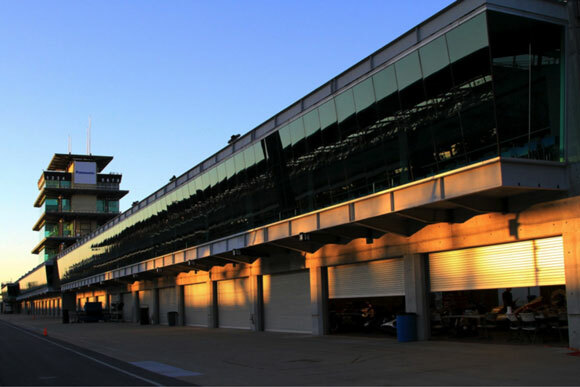 The third annual Brickyard Invitational was well run as usual, with lots of good weather and no luck whatsoever for the Duntov race team. Indy is always an ambitious event, but this year it was over the top. 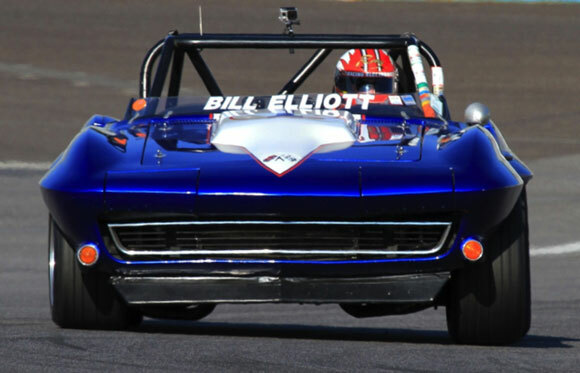 We had Jim Kitzmiller’s National Championship winning 1969 Corvette that was scheduled to be driven by Edward Sevadjian and Willie T. Ribbs in the Celebrity Pro-Am. Along with that we had two other big block Corvettes for Clair Schwendeman and Ray Evernham. The Evernham car was owned by Tony Parella, and was to be co-driven by NASCAR legend Bill Elliott. 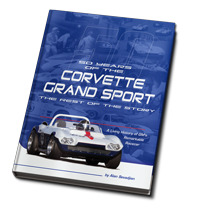 Duntov also had two other Parella cars to service, the red number 05 small block 1972 Corvette and his black 1958 Corvette. Duntov also serviced Susie Patterson’s blue Devin MG and Alan was asked to drive (and of course service) Sam Lecomte’s blue 1967 Camaro. Tony had Duntov bring the 05 car in case it was needed for the Pro-Am. That turned out to be the case. The drama started for us on Wednesday. Edward was first out in Kitzmiller’s Corvette and he immediately turned what would be the fastest Group 6 lap of the weekend. The car was perfect. Its last race was the Group 6 feature at COTA last year, which Edward won by a whisker with an engine that was slightly off song. Following an engine overhaul, Edward and Jim tested the car at Eagles Canyon almost every week in preparation for Indy. Willie came up for the final test and he was clearly impressed. The prep work had paid off, and the car was a rocket ship. It was Willie T. Ribbs’s turn in the car, and as he drove it he didn’t seem to notice the water and steam coming out from under the hood. When he came in, the crew noticed and traced the problem to a faulty water pump. The engine was cooked and the car had to be retired for the weekend. Edward and Willy moved to the backup car, Tony’s 72 Corvette. Clair was matched with Richie Hearn who flew in from his full-time job at the Ron Fellows Performance Driving School at Spring Mountain, Nevada. Ron turned out to be a real ringer – he was quick right off the bat, while many of the other Indy pros were not all that comfortable in the vintage hot rods. The pairing of Schwendeman and Hearn ended up finishing second in the Pro-Am, but only because they were black flagged for taking an inch or two off the chicane and had to serve a drive-through penalty. That cost them almost 40 seconds. Without that, they would have won. It is a tribute to the two drivers that they finished second in spite of the penalty! Clair leads Al Unser, Jr. in the Pro-Am. 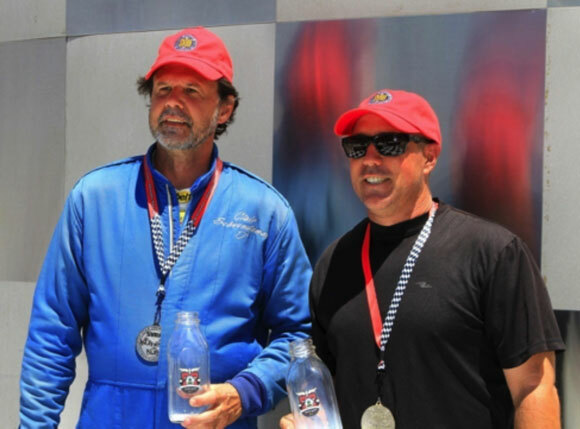 Peter Klutt and Unser Jr. finished third. Clair Schwendeman and Richie Hearn pose with their traditional bottles of milk. Edward didn’t bother to run the 05 car in the first qualifying session but in the second session he qualified the car on the pole. Duntov had four of the thirty-three cars in the Pro-Am race. Edward and Willie finished 18th when their engine went off-song about the time the green flag fell. Amazingly, they came in second among the Duntov entries. The Evernham / Bill Elliott big-block 65 Corvette only made five laps when the driveshaft broke. Tony had taken this car in on trade and was assured it was “race-ready,” and it was, as long as it was a four lap race. The car, however, did not finish last. Last place went to Sam Lecomte’s Camaro that Alan got a whole four laps in before its engine exploded. Alan coasted to and stopped in the middle of Indy oval Turn One, a perfect place to watch the race safely out of everyone’s way. 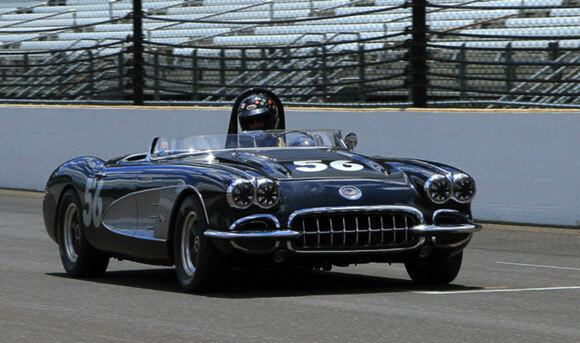 The Evernham / Elliott big-block 1965 Corvette. It was OK when it was running, but it didn’t run for long. Neither Bill Elliott nor Jaques Lazier got in their cars during the race, but both took it like the pros they are. After the Pro-Am, the Group 6 races didn’t seem all that important. 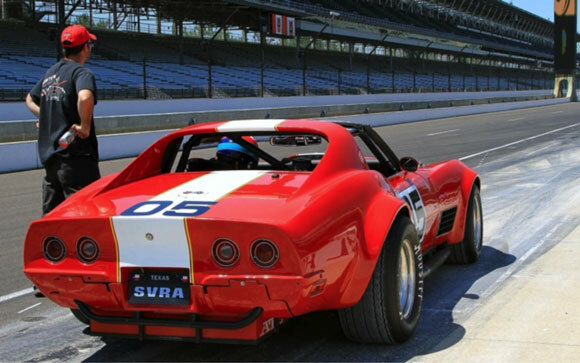 Three of the four cars Duntov had in the Pro-Am were out, so only Clair 1968 Corvette made the grid. He turned his fastest lap of the weekend and finished third on Sunday, so Clair got another trip to the podium and another memorial bottle of milk. The enduro was typical of how the whole weekend went for Alan. 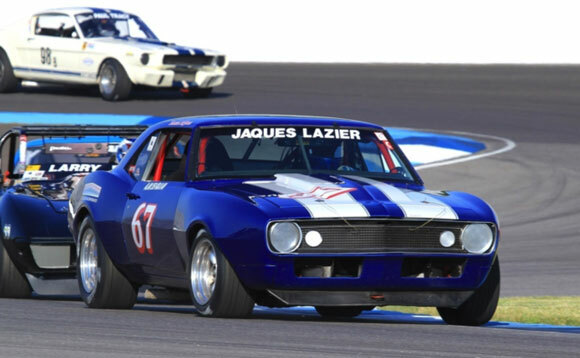 After Sam Lecomte’s Camaro blew up and finished last in the Pro-Am, Alan was looking forward to a repeat of last year’s Indy enduro win as he was again teamed with Clair Schwendeman. Alan was suited up and ready to go when an alert crewmember noticed the left front caliper was leaking. A replacement caliper was fitted to the car and the bleeding process was underway as the field left the false grid. There would be no repeat win tor the Clair Schwendeman / Alan Sevadjian team this year, as they never even got on track. 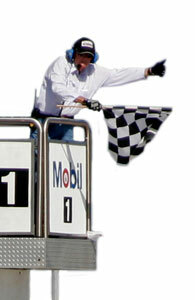 Unfortunately during major events Tony rarely gets a chance to enjoy driving his cars and competing on the racetrack. He is under constant attack from all directions as SVRA’s CEO and as the default court of last resort for every driver with a beef. This weekend he got in exactly two sessions in his black 58 Corvette. He retired after running in the lead pack during the first Group 4 race. 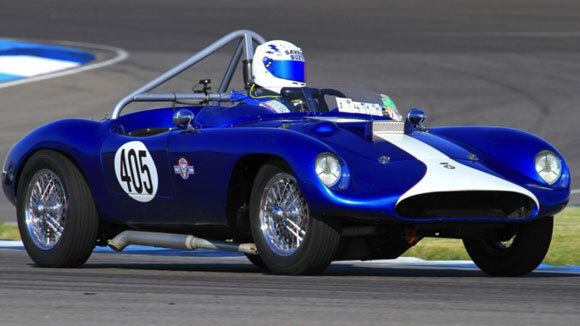 Susie Patterson in her 1952 Devin MG Special. Susie Patterson had a ball at Indy. Her car is an MG-TD with a Devin body. The car only has 95 horsepower, and those horses only show up in a narrow RPM band. Below 5000 it makes about 40 horsepower. Unfortunately, it doesn’t have enough power to get up to a speed where the Devin’s aerodynamic shape could make a difference. The book slots the Devin in Group 4, but it really should be in Group 1 where it would still be a challenge, even for the likes of Ayrton Senna. Group 1 is supposed to be way slower than Group 4, but at Indy the pole time in Group 1 was three seconds faster than the pole in Group 4! Susie qualified 45 seconds off the Group 1 pole time of a 1961 Lotus 20. The amazing thing about Susie is she doesn’t seem to mind. She is always a pleasure to be around, and she loves that Devin. If only she would let Duntov put a Chevy in that car. Then Susie would have something for that Lotus. Saturday’s Group 6 race saw Jody O’Donnell’s big block Corvette stay extremely wide for almost an entire race, much to the irritation of a determined Peter Klutt in his A Production small block Corvette. Finally Klutt went off trying another pass and seemed doomed to second when Jody looked in the mirror for Klutt while going down the main straightaway and missed his braking point for Turn 1. He spun and gave the race back to Klutt. 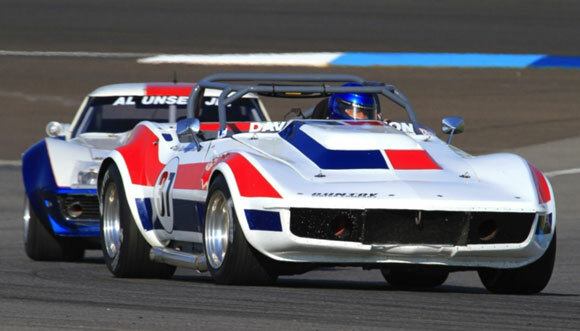 Klutt had had enough and didn’t run on Sunday, and the top three were the same without him – O’Donnell, Wall (Cobra) and Clair Schwendeman in his Duntov Corvette. Larry Ligas just beat out Andre Ahrle’s Cobra for fourth.